Regan Smith arrived in the NASCAR Sprint Cup series in 2007 as a co-owner of the Ginn Racing #01 Chevrolet (driving alongside Mark Martin). A promising young talent, Smith's career hit a stumble in 2008. After one-full season in the Sprint Cup where achieved this 2008 season's Rookie of the Year title and almost won the race at Talladega, Smith received the short end of the stick due to multiple team mergers. First with the Ginn Racing team merging with Dale Earnhardt Incorporated in 2007, Chip Ganassi with Felix Sabates Racing's organization would join after the 2008 NASCAR Sprint Cup season. Limited to a four-car team, Smith's team was excluded in favour of Ganassi's #42 car driven by the more established Juan Pablo Montoya. Undaunted by the setback and the highly-competitive nature of simply becoming a Sprint Cup series regular driver, Regan Smith signed with the #78 Furniture Row Racing team. A single car operation the Furniture Row Racing team was always regarded as an outsider compared to the NASCAR superteams which consisted of multi-car stables. Their base in Colorado rather than the traditional race shop in North Carolina went further to bring light to the inconformity of Furniture Row Racing. Despite being funded on a more modest basis, the Furniture Row Racing #78 Chevrolet was not enticed by the quick cash of a "Start and Park" effort. In every race the #78 Chevrolet competed, the team was seen performing at their full competitive ability. Teaming with Regan Smith in 2009, the partnership has pay dividends in 2011. After 95 races, Regan Smith secured his first top-10 finish at the 2011 Daytona 500. For the May 7th Showtime Southern 500 at Darlington Raceway, the pairing scored a major coup for the underdog. After a top qualifying run, the #4 Red Bull Toyota piloted by Kasey Kahne led the 43-car field to green starting the Showtime Southern 500. An initial run that lasted only 7 laps at Darlington Raceway, the #60 car of Mike Skinner spun to draw caution. As the field was regrouped, the Stewart/Haas Racing #39 Chevrolet driven by Ryan Newman snuck around the #4 car of Kahne to lead the race's early stages. As the race progressed, another drivers taking stints at the front of the NASCAR Sprint Cup race included Jamie McMurray, Kyle Busch, Kevin Harvick and Carl Edwards. For much of the Showtime Southern 500 at Darlington Raceway, a three-way battle between Edwards, Kyle Busch and Kasey Kahne made up the complexion of the event combining to lead 259 of the scheduled 367 laps distance. Struggling to please the temperament of the track known as the 'Lady in Black', the Hendrick Motorsport Chevrolets had a less than successful Saturday night race at Darlington. Collectively, the top-flight operation finished in modesty but were hardly a factor. In fact, the team did not lead a single lap at the 1.366-mile oval. The most dramatic display of the Hendrick Motorsport team's poor showing was Jimmie Johnson and his #48 Chevrolet spun twice during the event. 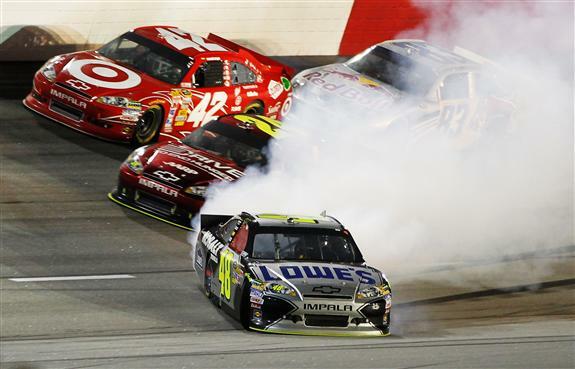 Despite of this difficulty, the 5-time Sprint Cup champ would finish 15th in the final running order. Another on track incident for a Hendrick Motorsport Chevrolet resulted when Dale Earnhardt Jr's #88 car was nabbed by NASCAR as hitting a pit road commitment cone. Running in the top-10 at the time of the gaffe, Earnhardt Jr was assessed a drive-through pit road penalty costing him a lead lap placing which he would not be able to regain until very late in the Showtime Southern 500. In less eventful outcomes, Mark Martin finished 19th while Jeff Gordon led the Hendrick Motorsport group with a 12th place finish. With just 9 laps remaining in the Showtime Southern 500 at Darlington, a yellow flag disturbed the race led at this point by Kasey Kahne who had just snatched the lead from the #99 Ford of Carl Edwards. Setting up a final run, many of the cars at the front of the field pitted for fresh tires including Edwards and Kahne. 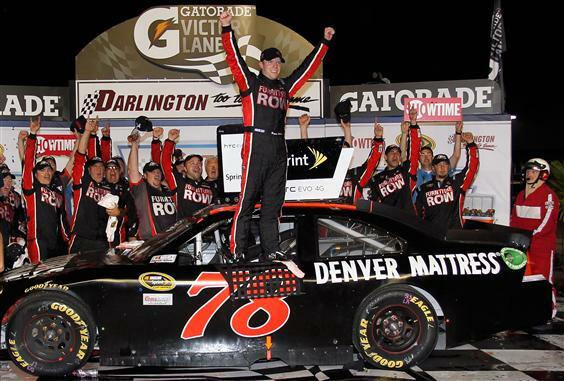 However, a gutsy call was made by the #78 Furniture Row Racing team opting instead for track position at Darlington. Historically an ill-advised move, the car driven by Ragen Smith was hoping to take advantage of a recent resurfacing of the Darlington Raceway where older tires are not a sign of complete doom. Needing only to held off competitors for 5 laps, Smith could pull off a major upset in NASCAR Sprint Cup. As the race restarted on lap 262, Regan Smith launched while a clan of NASCAR Sprint Cup cars were actively fighting for every position through the late stages of the Showtime Southern 500. The most heated affair through the last laps on track occurred between Kyle Busch's #18 Toyota and Kevin Harvick driving the #29 Chevrolet. With three laps to go, Harvick and Busch along with the #33 of Clint Bowyer were exiting turn 4 when the two cars came together. The latest of a series of minor expresses of disrespect through the race, this time their contact contributed to incidental contact with the Richard Childress Racing #33 Chevrolet. Bowyer crashed hard into the inner frontstretch wall. Bowyer was unhurt but the focus immediately shifted off the wrecked #33 car. 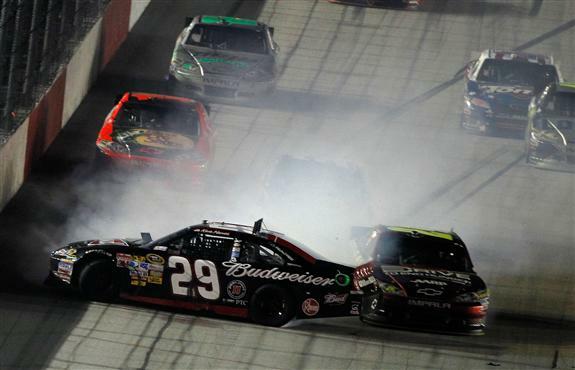 During the time span when Clint Bowyer crashed, Kyle Busch had turned down into the rear right corner of Kevin Harvick's Chevrolet sending the #29 spinning in front of the field. An angry Harvick was able to avoid any major damage as the yellow flag dropped for the 11th and final time at Darlington. Setting up a green-white-checkered restart, Regan Smith continued to lead having his #78 Chevrolet slipping through every corner as he tried to stay out front of the Darlington event. Charging the Furniture Row Racing car was the #99 Ford of Carl Edwards using four newer tires to challenge the leading opponent on older tires. Maintaining control and the 1st place spot, Regan Smith crossed the start-finish line winning the Showtime Southern 500. A first win for Smith NASCAR Sprint Cup, the victory lane celebration was also the first time the Furniture Row Racing team collected a win. As Regan Smith celebrated in victory lane, almost every competitor in the race voiced their deepest congratulations and praise for the 2011 Darlington Sprint Cup winner including 2nd place Carl Edwards. However, while a magical upset victory occurred at Darlington Raceway, the tone of post-race was monopolized by the borderline dangerous hi jinks of Kyle Busch and Kevin Harvick. On the cool down lap after the Showtime Southern 500, Harvick's #29 Chevrolet was running close behind the #18 Toyota of Busch. Two drivers known for their volatile on-track personas, the two expressed mutual disgust with each other through their cars. Eventually ending up on pit lane, Kyle Busch was blocked by Kevin Harvick's car as the Richard Childress Racing driver exited his vehicle while a crew member of the #29 ran towards the pair. As Harvick stepped out of his car and approached Busch's driver side window, the #18 Toyota violently accelerated ramming the #29 Chevrolet sending it coasting into a pit road wall. With both drivers angry following event, NASCAR called both drivers to the officials' hauler and later assessed them each a mild $25,000 fine. The win in the Showtime Southern 500 at Darlington by Regan Smith is the second time in 2011 a young, underdog driver won his first win on a historically significant NASCAR track. The first being Trevor Bayne's win at the Daytona 500 in February.